You best believe there was a bit of boozin’ going on backstage at some of the world’s biggest rock shows. 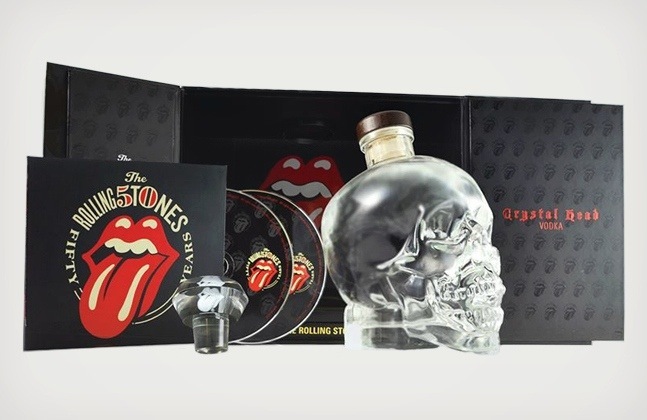 In honor of that partying spirit, Crystal Head Vodka has teamed up with the Rolling Stones to release this 50th Anniversary Gift Set. Included is a bottle of Crystal Head Vodka (feel free to mix it with orange to get your Keith Richards on), a handcrafted display case, a 2-disc live compilation CD that will take you through the five decades of Stones awesomeness, and a crystal decanter top engraved with the tongue and lip logo. So put on the CD, break out and few glasses, and get some groupies on the horn to start your own party. This entry was posted in Design, Icons, Music and tagged 50th, Anniversary, Gift Set, Rolling Stones, Skull, Vodka. Bookmark the permalink.